Three runners on our home track of Flemington on Sunday when Barthelona, Saracino and Yesterday’s Songs contest consecutive races. Yesterday’s Songs is the first to go in race five, the Ken Cox Handicap over 1000m with Patrick Moloney to ride. The seven-year-old was only beaten three lengths at his last start over 1400m at Flemington. “We’ve taken him back to the 1000m as I wanted to run him up the straight,” Moroney said. “We’ve kept him very fresh and have put the tongue tie back on. He’s got the ability - it’s just delivering it on race day. Barthelona runs in race six, the ATA Celebrates Women Trainers Handicap over 1400m with Lachlan King claiming from barrier 12. Barthelona is racing well and has not finished out of the first four his last 11 starts, winning at Sandown two starts back. “Unfortunately the wide draw is not ideal from that start,” Moroney said. “He’ll need a bit of luck from there and it’s a strong field but against that he’s dropped right down in the weight. Saracino (pictured) rounds out the day in race seven, the Rod Johnson Handicap over 1400m with Patrick Moloney to ride and jumping from barrier 12. “I’m just hoping the track hasn’t dried out too much by the time his race comes around,” Moroney said. “I’m not too concerned with the wide draw as he’s got the speed to cross them, it’s more the pressure that he gets as there are a couple of others in the race that go forward. 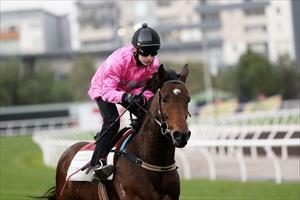 “He’s been going well for Patrick in a jumpout and on the track so if he can get a soft lead that gives him a chance.